Spry Techies is your premier web application development team with experience, expertise and exposure to latest technologies and processes to help your business succeed. We provide application development services from distributed presence firms to technology start-ups looking to engage with a dedicated team for their success. 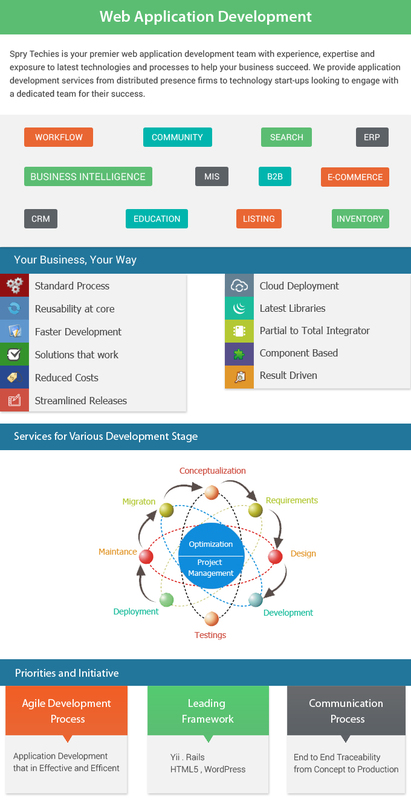 Whether you are looking to enhance your current application or build new integrating modules to others, we have flexible engagement and project management models to help you feel comfortable with the development period and focus on conducting your business without worrying about the application development. Our project processes designate a single point of contact, who has visibility of the entire development progress with view of status of deliveries, so you can least worry about managing a team of designers, analysts, developers and quality engineers. We always focus on the results and expectations of our customers, while deeply into the development phases. Our result driven development process divides every project in smaller phases and smaller sub-tasks, with individual results and targets set up. This approach helps every sub-team to stay focused on the system targets and deliveries. Every team works towards adding value from their side to the project and works coherently to drive it to success. We value collaboration and interactions more than classic documentation based approaches, surely a working software helps a business more than any documentation heap ever can. With time a lot of open-source technologies have found place in various business verticals and processes, Wordpress, Drupal, Magento and many others are automatic picks for some businesses or to support some processes/ workflows at organizations. We provide services that are tailor-made yet based out of these open-source gems. Customized application development is core of our application development solutions, and we understand that the internet eco-system requires applications to integrate and interact with other applications and technologies like APIs, web-services and data-engines. Our application development practices do not look at these as exceptions, but more as a part of every web application development for it to achieve the greater goals and utilize the latest third-party provided functionalities for success.